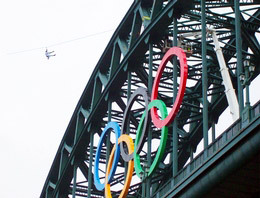 On the 15th June Facelift played a vital role in directing the Olympic flame, on its 28 day journey around the UK – helping the flame to pass across the River Tyne on a zip wire at full speed. The torch was in the capable hands of adventurer and TV presenter Bear Grylls - star of the TV series Man vs Wild and Born Survivor, where he shows viewers how to survive in dangerous, inhospitable parts of the world. Using a Bronto 46 powered access platform, we raised Bear Grylls up into the rafters of the bridge – to jump off the bridge, from the 195 ft arch and saw him land safely in the parade ground of HMS Calliope, whilst being watched by thousands of people. You can see Bear and previous torch bearer Maria Espinoza get lifted in the BBC live footage of Day 28 - click through to the afternoon session, then the lifts are at 18:48 onwards. Earlier that day, football legend Jack Charlton had carried the flame through the Newcastle city centre and was one of the 141 torchbearers to carry the flame. "I was kind of worried about the torch going out but it stayed alight - it was amazing. I was a bit nervous about rope and fire but it was fine and we are in one piece." He added: "I think you're not human if you're not nervous when you're standing 200ft up and it's blowing you around a little bit. It's a long drop. It's still alight, we're alive and I'm super proud to have carried the torch." The flame arrived in the UK on the 18th May from Greece and the relay began at Land’s End, Cornwall shortly after. During the 8,000 mile, 70-day journey to the opening ceremony on the 27th July, the flame will be carried by a total of 8,000 people.